While we tend to associate emerging infectious diseases with remote, often exotic locations around the world, in truth there are many novel threats in our own back yard. To this growing list we can add - thanks to a Dispatch published yesterday in the EID Journal - a novel poxvirus recently detected in wild rodents in East Texas. How much of a threat (if any) this newly discovered virus poses to human health remains unanswered, but several other poxviruses - including smallpox (now eradicated) and Monkeypox (actively circulating in Africa) - have proven to be serious human health threats. First some excerpts from the EID dispatch, then I'll return with a bit more. Northern pygmy mice from 2 localities in East-Central Texas, USA, had proliferative epidermal lesions on the tail and feet. Electron microscopy of lesion tissue revealed poxvirus. Phylogenetic analyses indicated the virus differed 35% from its closest relatives, the Chordopoxvirinae. Future research is needed to determine whether this virus could affect human health. The poxvirus sequenced from B. taylori in east-central Texas is distinct from previously identified viruses, with genetic distances similar to those observed between genera (online Technical Appendix[PDF - 210 KB - 2 pages] Table). Although support for several phylogenetic relationships is low (possibly due to high genetic variation within Chordopoxvirinae), the genetic data strongly suggest this poxvirus does not belong to any recognized genus as of March 2018. We propose the tentative species name Brazospox virus in reference to the proximity of both field sites to the Brazos River. 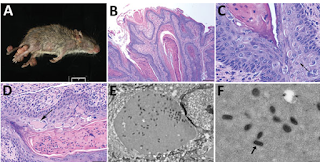 The epidermal lesions produced by the virus are unique among previously described poxviruses of wild rodents, being proliferative rather than ulcerative in nature, and lacking systemic involvement (7,11). The population-level implications of this poxvirus on hosts are unclear. The 2 mice in this study represent the spectrum of observed pathology, from severe (mouse 1) to mild (mouse 2). The virus was confirmed at 2 different localities, and field notes indicate similar lesions were observed in other rodent species. During 20132017 (12,13), among ≈1,800 rodents captured during field research in east-central Texas, we documented proliferative lesions on the tail or feet of >17 individual rodents of 3 species (B. taylori, n = 12; Chaetodipus hispidus, n = 2; Sigmodon hispidus, n = 3). The combined distributional range of these 3 host species includes >20 US states and a large portion of Mexico (14). Novel poxviruses identified in wildlife populations might be useful for the identification of threats to human and animal health. The description of these new viruses contributes to the study of viral diversity and pathogenesis. Propagation of the Brazospox virus in cell culture for use in infection studies, coupled with expanded field surveillance, examination of museum specimens, and full genome analysis could yield additional clues to the origin, pathogenesis, and potential host range of this novel poxvirus. Dr. Hodo is a veterinary pathologist and postdoctoral associate at the College of Veterinary Medicine at Texas A&M University (College Station, Texas), with interests in wildlife pathology, disease ecology, and epidemiology. The host range for poxviruses is highly varied and often quite narrow - with some genera only infecting birds, or reptiles, or cervids - while others, like Monkeypox, demonstrating a much wider host range (rodents, primates, humans, etc.). Fifteen years ago we saw a rare outbreak of Monkeypox in the United States when a Texas animal distributor imported hundreds of small animals from Ghana, which in turn infected prairie dogs that were subsequently sold to the public (see MMWR Update On Monkeypox 2003). By the time this outbreak was quashed, the U.S. saw 37 confirmed, 12 probable, and 22 suspected human cases. Among the confirmed cases 5 were categorized as being severely ill, while 9 were hospitalized for > 48 hrs; although no patients died (cite). Global smallpox vaccination ended nearly 50 years ago - which means our community immunity to these types of viruses continues to wane - making poxviruses a growing concern (see EID Journal: Extended H-2-H Transmission during a Monkeypox Outbreak). The CDC maintains a POXVIRUS website, which provides additional information on this growing family of viruses. Poxviruses are brick or oval-shaped viruses with large double-stranded DNA genomes. Poxviruses exist throughout the world and cause disease in humans and many other types of animals. Poxvirus infections typically result in the formation of lesions, skin nodules, or disseminated rash. Infection in humans usually occurs due to contact with contaminated animals, people, or materials. While some poxviruses, such as smallpox (variola virus), no longer exist in nature, other poxviruses can still cause disease. These include monkeypox virus, orf virus, molluscum contagiosum, and others.